Millennials generally are described as those born in the 1980s and 1990s, which means the oldest members of the generation—also known as Generation Y—began entering the workforce in the late 1990s and early 2000s. According to the Pew Research Center, Millennials surpassed all other generations in 2016 as the largest portion of the workforce. As of 2017, 56 million members of the workforce were born between 1981 and 1996, compared to Generation X, which accounted for about 53 million, and baby boomers, who accounted for about 41 million. While most generations are connected to certain stereotypes and cliches, it's important to remember that employees still are individuals and should not be judged solely on the basis of when they were born. Still, there are some measurable differences in when and how millennials were raised and educated, and understanding these differences can make it easier to manage them in the workforce. 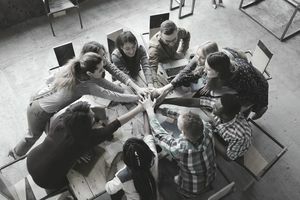 One of the changes in approaches to education during the decades when millennials went to school was an increased emphasis on teamwork and group projects. From elementary school through college, it was common for members of this generation to be asked to accomplish tasks as part of a team. By structuring your staff in a way that relies on everyone working together with defined roles, you'll be able to take advantage of what might be a strength for some of your younger employees. Millennials are the first generation to grow up with the internet as an everyday part of their lives. They are the first to embrace and take advantage of technology that connects people electronically. This experience and knowledge can help expand communication both internally and externally for your firm. Pew's research shows that millennials account for more people who identify as multiracial than any other generation. A survey by Deloitte shows that more than 40 percent of millennials expect to leave their jobs within two years and fewer than 30 percent want to be in the same job for more than five years. The same Deloitte survey shows that millennials value and are most willing to stick with companies that have diverse management teams flexible work environments. Taking advantage of this means building a diverse leadership team and staff in addition to seeking out diverse clients. As well, provide a work environment with opportunities for advancement and new challenges. When technology company Qualtrics did research into millennials it found the perception that the generation is lazy is based on a disconnect between millennials and older generations when it comes to prioritizing structure and processes. While older generations value things like fixed work schedules and dress codes, millennials are more focused on end results. This means it's important to relax the rules a bit. A lot of millennials are hard workers who get results, but to connect with them and retain them, you might have to be willing to live with a more flexible schedule and a less restrictive dress code. Combine different traits like technological savvy and being results-oriented, and you get employees who are capable of doing good work in ways that weren't as easily available to previous generations. Many millennials believe they should have the option to work remotely on occasion or even exclusively as long as they are getting their work done. Be flexible in this regard, and you'll have more success attracting and retaining members of this generation. Want 5 Tips for Building a Learning Culture in Your Workplace?